An interesting proposition for e-sports enthusiast looking for good headphones with an interesting design at an attractive price. Accurate sound reproduction will allow you to quickly identify reload, movement and shot the enemy, making the model ideal for FPS type games. Built-in microphone is used when communicating with other players and visible pilot seated on the cable will quickly change the basic settings for sound or mute the microphone. Used special materials with earmuffs provide a comfortable game even for many hours without fatigue. It does not matter if you are playing, listening to music or working - your comfort is a key to success. Riot V2 headphones model is equipped with high quality soft ear cushions. Thanks to this you can use your headphones without being tired for long time. Built-in microphone and volume controller placed on ear cup allows you to set everything quickly and very precise. 3 connectors ( 2x minijack and USB for LED only) will allow you to connect to various devices. Functional design ensures comfort even with long hours of competition! You will appreciate our headphones during night gaming session thanks to red LED backlight of the headphones. 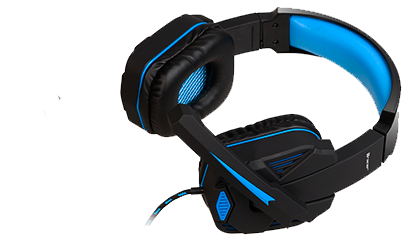 Headphones 7.1 TRACER SECTOR is a technologically advanced, innovative headphones designed for FPS gamers. SECTOR provides a representation of a real and realistic surround sound, eg. During the fierce competition in the game. Dedicated software allows you to get the best sound effects shots, explosions, reloading weapons, ammunition, steps performed both your and rival. Earphones have an integrated microphone, allowing for convenient communication with partners. The device uses durable braided cable that provides durability and reliability for years to come. Another advantage is the location on the cable universal controller to control the most important functions (next / previous track, Volume up / down, on / off microphone). Tracer Xplosive headphones are designed for comfort and ergonomics, which ensures comfort of use. Sponge earmuffs are covered with high-quality material that allows for long use without fatigue. The advantage of the device is also attractive design. The integrated microphone allows for precise positioning and excellent communication - adjustable using a controller placed on the cable. High quality individual components ensures smooth operation of the headphones.